What Are The Types Of Freezers Available? Box-like design with a top-mounted door, like a lid. Generally, offers more storage space, so it's suited to storing bulky items, like large cuts of meats. Effectively keeps cold air inside because of the top-mounted door (cold air travels downwards). Looks like a traditional fridge with a front-mounted door. Shape is better suited to most kitchen layouts. Food is stored horizontally on shelves, which is easier to access. Like most household appliances, a freezer's dimensions – the height, width and depth – are measured in millimetres (mm). Generally, chest freezers are bulkier than upright ones, but the latter are usually taller. Before buying a freezer, measure the available floor space to guarantee it will fit, including at least 50mm of extra space at the top, back and sides for ventilation; this allows the heat produced by the freezer to escape. It's also a good idea to measure all the access points in your house or unit, such as staircases, doorways and ceiling clearance. Freezer Capacity: How Much Do I Need? 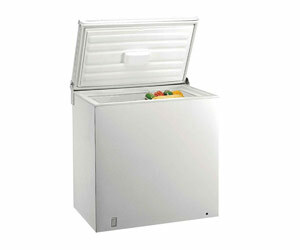 A freezer's capacity is measured in litres (L) and tells you how much food can be stored inside it. The freezer capacity that's right for you depends on the size of your household and the amount of frozen food you purchase each week. 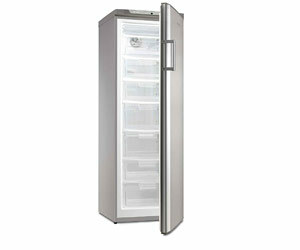 If you bulk-buy or regularly purchase large items, go for a chest freezer with a larger capacity. Don't buy a freezer that's too big because this will take up floor space and affect your electricity bill. Upright freezers have horizontal shelves, just like a fridge. Some chest freezers come with removable baskets that can be lifted out for easier access. Cleaning the inside of your freezer can be a little easier with plastic shelves or baskets as opposed to wire ones, which are awkward to wash and may rust. Removable one-piece shelves or baskets can help trap spills and are easy to wipe down. With an upright (vertical) freezer food items are stored on horizontal shelves, so they're easily accessed by opening the freezer door. A chest freezer, on the other hand, requires you to stack food, which can make it difficult to reach items at the bottom, especially in larger-capacity models. Manual Defrosting Vs. Frost-Free – Which Do I Choose? With a manual defrost freezer, you need to physically remove layers of ice that build up inside its compartment on a regular basis. The process involves removing the freezer's contents and switching off the power to allow the ice to melt. Choose a model with a water drain outlet and drain hose – usually at the rear of the freezer – to make it easier to remove melted ice. A frost-free freezer doesn't require you to manually remove ice from its shelves or freezer walls. Instead, it uses fans to circulate dry, cold air, which stops ice from building up inside the cabinet. No ice makes temperatures inside the freezer more evenly spread, which improves food quality and energy efficiency. Overall, freezers that display more stars and lower kilowatt hours (kWh) will use less energy, cost less to run and be friendlier on the environment. Auto Fast-Freeze automatically adjusts the temperature to freeze food items quickly and keep them fresh. This feature is handy for when the freezer door is constantly being opened or when warmer items are placed inside the freezer. Before purchasing a freezer, find out how much noise you can expect from its internal fans, motors and automatic timers. This is important if it's going to be positioned near living spaces. 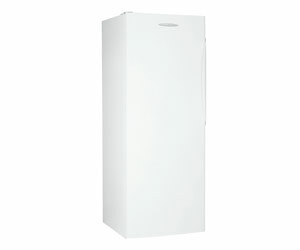 Thanks to their boxy design, chest freezers are not particularly attractive; upright freezers are generally more stylish. They're available in different finishes, including traditional white and stainless steel. If your freezer doesn't have to be stored in your kitchen and is out of sight – you can keep it in the garage or laundry – style is less of an issue.